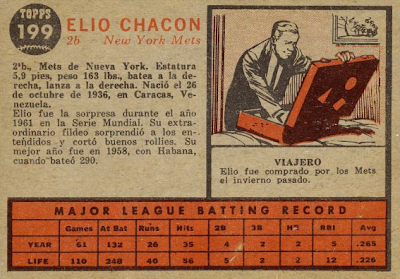 Today's profile marked the third year Topps licensed their set for printing in Venezuela, one of the world's few countries to follow baseball more fervently than soccer. (America being another.) This practice continued irregularly through the 60s, as baseball sets skipped over 1961, 1963, and 1965. 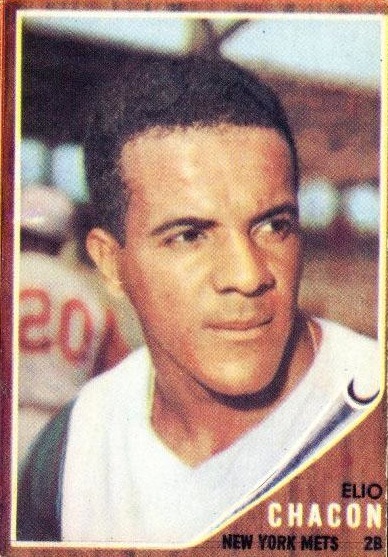 Four characteristics distinguish the 1962 Venezuelan set from the Topps American version. 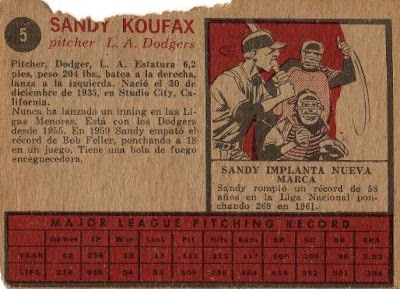 Almost all Venezuelan baseball cards, even the popular stars, prove a challenge to track down and take deep pockets to acquire. When Robert Edward Auctions offered a low-grade set in 2008, bidding closed at over $7000. Here's one of the new native players, Elio Chacon; he and Luis Aparicio (#200) replaced cards #197 and #198. That makes #200 the highest number, but total set size remains 198. The cartoon text translates as "TRAVELER: Elio was purchased by the Mets last winter." 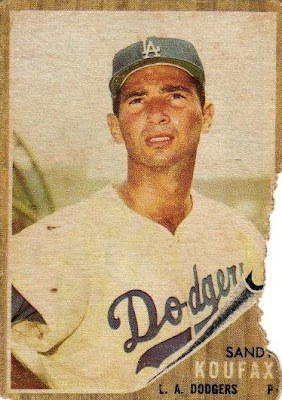 Value: This low-grade Koufax cost $28 on eBay, a relative bargain. High grade examples run into the hundreds, though "high grade" usually means EX at best for Venezuelans. Fakes / reprints: Haven't seen any Venezuelan fakes, but people sometimes mistake them for American versions. Look for the Spanish text and pinker back coloring.